The Arri Group is a global supplier of motion picture film equipment. Based in Munich, the company was founded in 1917. It produces professional motion picture cameras, lenses, lighting and postproduction equipment. Hermann Simon mentioned this company in his book Hidden Champions of the 21st Century as an example of a Hidden Champion. The Arri Alexa camera system was used to film Academy Award winners for Best Cinematography including Hugo, Life of Pi, Gravity, Birdman and The Revenant. Arri was founded in Munich, Germany on 12 September 1917 by August Arnold and Robert Richter as Arnold & Richter Cine Technik. The abbreviation Arri was derived from the initial two letters of the founders' surnames, Arnold and Richter. In 1924, Arnold and Richter developed their first film camera, the small and portable Kinarri 35. In 1937, Arri introduced the world's first reflex mirror shutter in the Arriflex 35 camera, an invention of longtime engineer Erich Kästner. This technology employs a rotating mirror that allows a continuous motor to operate the camera while providing parallax-free reflex viewing to the operator, and the ability to focus the image by eye through the viewfinder, much like an SLR camera for still photography. The reflex design was subsequently used in almost every professional motion picture film camera and is still used in the Arri Alexa Studio digital camera. The first Hollywood film to employ an Arriflex was the 1947 Humphrey Bogart and Lauren Bacall film Dark Passage in 1947. Over the years, more than 17,000 Arriflex 35s were built. The design was recognized with two Scientific and Technical Academy Awards in 1966 and 1982. In 1952, Arri introduced the Arriflex 16ST, the first professional 16mm camera with a reflex viewing system. In 1965, a self-blimped 16mm camera was released: the Arriflex 16BL. The Arriflex 35BL followed in 1972 as a lightweight, quiet alternative to the rather heavy and cumbersome blimped cameras of the time. Also in 1972, Arri pioneered the development of daylight luminaires with the Arrisonne 2000 W. The Arriflex 16SR, launched in 1975, featured a redesigned viewfinder with a through-the-lens light meter. The Arriflex 765, a 65mm camera, was released in 1989, partly in response to the growing industry demand for 70mm release prints. The Arriflex 535 camera was released in 1990, followed by the Arriflex 535B and the Arriflex 16SR 3 in 1992. The Arriflex 435 was released in 1994. Arri partnered with Carl Zeiss AG in order to develop and manufacture advanced lenses for the motion picture industry. In 1998, Arri released the Ultra Prime lenses. Development of the Arrilaser, a postproduction film recorder, began in 1997 and it was released for beta testing in 1998. In 2000, Arri purchased the company Moviecam and developed Arricam, a 35mm camera platform. In 2003, Arri developed its first digital camera, the Arriflex D-20, which later evolved into the D-21. The camera used a 35mm CMOS sensor (instead of CCD) and allowed cinematographers to utilize standard 35mm lenses. This technology was further developed and improved for the Arri Alexa camera. Arri revealed its Arriscan prototype during IBC 2003. The 16mm/35mm film scanner worked alongside the Arrilaser to support the increasingly popular digital intermediate route through postproduction. Later, the Arriscan became a widely used tool for film restoration work and was recognized with a Scientific and Engineering Academy Award in 2009. Arri released the Master Prime lenses in 2005, designed for a super-fast aperture of T1.3 without breathing and distortion. In 2007, the Master Prime 14mm and 150mm lenses were released. The Arrilaser 2 was released in 2009, with new client-server architecture and speeds twice as fast as the original model. In 2011, the Arrilaser was recognized with an Academy Award of Merit. In 2010, the Arri Alexa camera was released. The camera had the ability to compress 1080p footage to ProRes QuickTime formats and allowed direct-to-edit workflows. Later, models were added to the range including the Alexa Plus, Alexa Studio and Alexa M, which was designed to get the camera closer to the action, The Alexa Plus 4:3, like the Alexa Studio, allowed the full area of the sensor to be used with anamorphic lenses. The 16mm Arriflex 416 camera and Ultra Prime 16 lenses were used in the filming of the 2010 film, Black Swan. Arri announced a strategic partnership with Zeiss and Fujinon in 2010 to create new lenses that incorporated enhanced electronic lens data transfer in order to simplify visual effects workflows in postproduction. The Arri/Fujinon Alura Zooms were released that same year, while the Arri/Zeiss Master Anamorphic lens series was released in 2012. In 2013, Arri created Arri Medical, a business unit that utilizes its camera technology for medical purposes. Apart from a medical imaging documentation service, it has developed a fully digital 3D surgical microscope called the Arriscope. The Arri Alexa 65, released in 2014, was used in the filming of The Revenant as well as Mission Impossible: Rogue Nation and Star Wars: Rogue One. The Arri Amira camera was also released in 2014. In 2015, four of the five nominees for the cinematography category of the Academy Awards were filmed using the Arri Alexa. Arri's subsidiary postproduction and creative services company, Arri Film & TV, was renamed Arri Media in 2015 as part of a company restructuring. 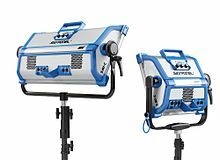 At NAB 2015, the SkyPanel LED fixtures were introduced by Arri. The SC60 and the SC30 have a full color tunable LED option. In April 2016, Arri acquired the Artemis camera stabilizer systems developed by Curt O. Schaller from Sachtler / Vitec Videocom. As a result, Arri became the exclusive seller of Artemis Trinity stabilizers. At NAB 2016, Arri unveiled its version of the Trinity system. Arrilaser film recorder is used for film-out. In 2011, it was alleged that Michael Bravin, an executive of the US-based subsidiary Arri Inc., had unlawfully accessed a rival company email account. A suit was brought before a US court and in September 2011, Bravin entered a guilty plea. Arri Inc. denied knowledge or gains from Bravin's actions, and a separate lawsuit against the company was dropped as a result of an out-of-court settlement. ^ "ARRI". weltmarktfuehrerindex.de. WMF. Retrieved 19 March 2019. ^ "About ARRI". arri.com. ARRI. Retrieved 19 March 2019. ^ "Arri's Second Century". ASC Mag. Retrieved May 10, 2018. ^ Evan Luzi (July 2, 2010). "Arri Alexa Pace 3D System Steadicam Rig For Hugo and Transformers 3". The Black and Blue. Retrieved September 20, 2016. ^ Jack Picone (November 26, 2014). "Best Cinematography: Looking At Life of Pi". New York Film Academy. Retrieved September 20, 2016. ^ "Which Cameras Were Used on the Oscar-Nominated films of 2014? Hint: It's a Small List". No Film School. January 20, 2014. Retrieved September 20, 2016. ^ "Which Cameras Were Used on the Oscar-Nominated Films of 2015?". No Film School. February 17, 2015. Retrieved September 20, 2016. ^ Karen Idelson (February 18, 2016). "Arri Alexa 65: From Landscapes to Rom-Coms, the Camera That's Won Over Lensers". Variety. Retrieved September 20, 2016. ^ "ARRI Group". CNBC. November 3, 2014. Retrieved September 19, 2016. ^ a b "About Arriflex". Calkovsky Cinema Worldwide. ^ Leitner, David (1 October 2010). "Bridging past and present". Filmmaker. Retrieved 5 May 2013 – via Questia Online Library. ^ Birchard, Robert (1 June 2008). "90 years of precision". American Cinematographer. Retrieved 5 May 2013 – via Questia Online Library. ^ Norris Pope (February 15, 2013). Chronicle of a Camera: The Arriflex 35 in North America, 1945-1972. University Press of Mississippi. ^ "Camera Profile - ARRIFLEX 16S Series". Cinema Technic. Retrieved September 20, 2016. ^ "The History of 16 MM Film and the Arriflex 16 S Camera". New York Film Academy. Retrieved September 20, 2016. ^ "Camera Profiles - Arriflex 16BL". CinemaTechnic. Retrieved July 6, 2016. ^ "Camera Profiles - ARRI ARRIFLEX 35BL Series". Cinema Technic. Retrieved September 20, 2016. ^ "Camera Profiles - Arri 16SR series". Cinema Technic. Retrieved September 20, 2016. ^ Alexander Felsenberg (1989). "Interview With Otto Blaschek". In 70mm. Retrieved September 20, 2016. ^ a b "Modern Motion Picture Cameras". IEC. Retrieved September 20, 2016. ^ "Instruction Manual" (PDF). CBADOC. Retrieved September 20, 2016. ^ "Lens Profiles - Arri Zeiss Ultra Prime Lenses". Cinema Technic. Retrieved September 19, 2016. ^ a b Debra Kaufman. "The Academy Award of Merit goes to... the ARRILASER Film Recorder". Creative Cow. Retrieved September 19, 2016. ^ Eric J. Olson (December 22, 1998). "Digital Domain tests new laser recorder". Variety. Retrieved September 19, 2016. ^ "ARRI D-20". Broadcast Store. Retrieved July 6, 2016. ^ "Arriscan To Arrive Summer 2004". Creative Planet. February 14, 2012. Retrieved September 20, 2016. ^ "2009 (82nd)". Oscars Awards Database. Retrieved July 6, 2016. ^ "The SciTech Award Goes to... ARRI/Zeiss Maser Prime Lenses for Motion Picture Photography". Creative Cow. Retrieved September 20, 2016. ^ Jon Fauer (December 5, 2010). "Zeiss Book". Film And Digital Times. Retrieved September 20, 2016. ^ "Master Prime Family Grows Wider and Longer". To 411 Daily. August 30, 2007. Retrieved September 20, 2016. ^ "Arri delivers Arrilaser 2 film recorder". Post Magazine. July 1, 2009. Retrieved September 20, 2016. ^ Chad Mumm (April 7, 2010). "ARRI's ALEXA busts out native ProRes recording, plans for RED smiting". Engadget. Retrieved September 20, 2016. ^ Michael Murie (May 16, 2012). "Unusual Camera Moves With the Alexa M". Film Maker Magazine. Retrieved September 20, 2016. ^ Bryant Frazer (April 26, 2012). "ARRI Announces ALEXA Plus 4:3". Studio Daily. Retrieved September 20, 2016. ^ Stephen Pizzello. "Danse Macabre". The American Society of Cinematographers. Retrieved September 20, 2016. ^ "ARRI, Zeiss and Fujinon Announce Partnership". PLSN. April 14, 2010. Retrieved September 19, 2016. ^ "Three Major Lens Manufacturers Announce Partnership". Definition Magazine. April 19, 2010. Retrieved September 19, 2016. ^ "Arri/Fujinon Alura: The Net Generation of Zooms". Studio Daily. April 12, 2010. Retrieved July 6, 2016. ^ "CinemaTechnic Lens Profiles - ARRI Zeiss Master Anamorphic Lenses". Cinema Technic. Retrieved July 6, 2016. ^ "Official website of Arri Medical". 10 May 2013. Retrieved 28 May 2013. ^ a b "Arri Medical Service". 10 May 2013. Retrieved 28 May 2013. ^ Carolyn Giardina (February 18, 2015). "Oscars: ARRI Alexa Camera of Choice for Nominees; Kodak Holds Its Own". The Hollywood Reporter. Retrieved September 20, 2016. ^ "ARRI Film & TV Becomes ARRI Media". Sound & Picture. May 26, 2015. Retrieved September 20, 2016. ^ Matthew Allard (May 18, 2016). "Hands on with the Arri SkyPanels - a single operator's perspective". News Shooter. Retrieved September 20, 2016. ^ a b c "Curt O. Schaller, artemis developer". schaller-media.de. Retrieved 19 May 2016. ^ a b c "ARRI Debuts Final Version of Trinity Stabilizer and Maxima Gimbal". Studio Daily. Retrieved 19 May 2016. ^ Michael Maher (April 20, 2016). "NAB 2016: ARRI Purchases the Artemis Trinity, Announces New Lenses, and More". The Beat. Retrieved September 19, 2016. ^ "ARRI Get Into The Camera Stabilisation Business". Definition Magazine. Retrieved September 19, 2016. ^ "Innovation Celebrated at the Academy's 2017 Sci-Tech Awards". ^ "Lolas: 'Toni Erdmann' Dominates German Film Awards". ^ "ARRI, Canon Among Engineering Emmy Recipients". ^ "'Former ARRI exec pleads guilty to hacking into rival CEO's e-mail account, faces jail time'". Engadget. September 23, 2011. ^ "'Guilty Plea Rocks Hollywood Camera Biz'". Deadlinen. September 2011. ^ "Camera maker Arri denies rival's espionage claims". Variety. February 14, 2012. Retrieved September 19, 2016. ^ "RED vs ARRI Lawsuit Settled". SCRI International. Retrieved September 19, 2016.